Whole body vibration training machines have a vibrating platform, upon which you can stand, sit or lie down. This device, which originated in Europe, supposedly strengthens your muscles, increases blood circulation and hastens weight loss. When news of these "good vibrations" hit the mainstream media, exercise equipment manufacturers rushed to create a vibration training machine for the home fitness market. The Energym Turbo Charger is an example. The emergence of vibration training exercise devices like the Turbo Charger provides irrefutable proof that everything old, or in this case ancient, eventually becomes new again. Vibration training dates to ancient Greece, explains coach Brian Mackenzie, in an article on his Sports Coach website. The Greeks wrapped one end of a sheet of fabric around the injured body part and tied to the other end to a saw, which provided the vibrations. Centuries later, Russian scientist Vladimir Nazarov tested vibration training on astronauts, and discovered that it allowed astronauts to stay in space longer, without losing bone density or muscle tone. The Turbo Charger features a platform, called the "8-degree core tech tilt," which produces oscillating vibrations, which are transmitted to the entire body. It comes with a body fat scanner, nine programs, 24 speed levels and a console with an LED display. The eight-degree core tech tilt platform moves the body around the core, causing the deeper core muscles to activate, in order to stabilize the body. Stand on the platform, and the vibrations flow through your feet. Depending on how high you set the amplitude setting, the vibrations eventually reach the rest of your body. Increasing the vibration frequency increases the number of vibrations your body receives per second, and increases the intensity of the workout. While no studies relate specifically to the Turbo Charger, many have been done regarding whole body vibration training. 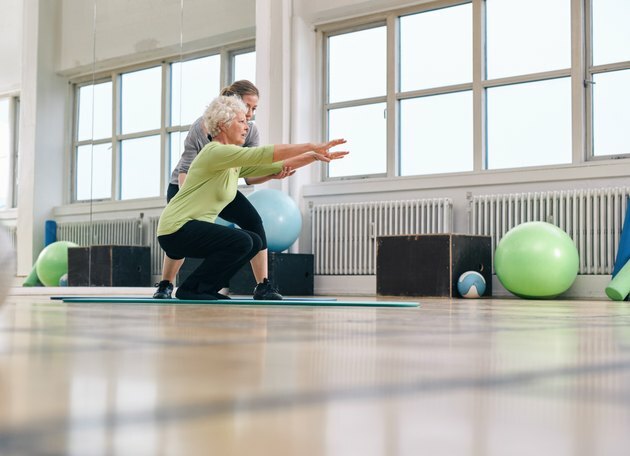 The results of a 2004 study published in the Journal of Bone and Mineral Research suggest that vibration training may increase bone mineral density in post-menopausal women. Another 2004 study, published in the International Journal of Sports Medicine, detailed the effects of a 24-week vibration training program for body composition. Lead author M. Roelants reported that the vibration training group showed a 2.2 percent lean muscle mass increase. While the manufacturers claim that simply standing on the vibrating platform has valuable health and fitness benefits, you can also perform squats and lunges, push-ups and bridging exercises on the Turbo Charger. Mayoclinic.com: Whole Body Vibration Training: An Effective Workout?